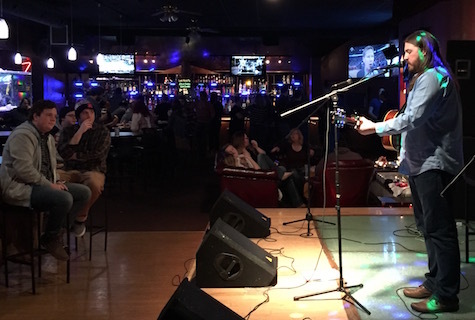 Brad Hoshaw at The Shark Club, March 19, 2016. Hoshaw plays tonight at Reverb Lounge. Speedy Ortiz’s third album, Twerp Verse, came out last week on Carpark Records. As part of the media blitz, Speedy’s Sadie Dupuis did an interview with The 405 where she declares her undying love for ARC’s Mike Mogis, who mixed the new album. You worked with Mike Mogis on this album, how did he come into it? Dupuis: Yes! We’ve been in touch with Mogis for years about doing a record. We became friends, probably three years ago, and I obviously am such a big fan of his. Maybe that’s not an obvious thing, but my holy trinity when I was in 9th and 10th grade were Bright Eyes, Cursive and Rilo Kiley, and I would order by mail Saddle Creek records. He was the first producer that I remember knowing the name of, so it was really very cool that we found out he was a fan of Speedy, and had invited us to come see his studio, and now every time we go through Omaha we stay with him. So we’d been wanting to do this record for a few years and the timing didn’t really work out for him to record it, but we were able to carve out some time for him to mix it. It’s the longest time I’ve ever spent in Omaha, normally I’m there for one or two nights, and we were there for close to three weeks. He’s obviously a thorough producer, but working with him as a mix engineer was so much more involved than any mixing process we’ve gone through; he really pays attention to the tiniest thing. For me, someone who’s an aspiring producer, it was really educational to see what kind of things he picks up on. Lyrics really matter to him in a way that I don’t think they always do to producers, especially when they’re strictly focused on the mixing. He’s automating every word so that everything’s audible, and just thinking very hard about the tone choices we made and how he can improve upon them. He has such an amazing assortment of gear that he’s collected over his however-many years of producing stuff, so that was really fun, to see what cool toys he’d be putting my guitars through on this particular track or day. So, yeah, only amazing things to say about Mogis, I really hope that we get to do a record from start to finish with him, maybe next time around. And what a childhood dream accomplished it was to do anything with him. There’s more at The 405. Mystic Valley Band member Nik Freitas dropped his first single, “What A Mess,” from his upcoming solo album Dark & Day out June 29. Among the guests on the record is Azure Ray’s Maria Taylor. Freitas is also slated to play at fabulous O’Leaver’s June 8 with Miwi Laupa. Former Omahan Mike Jaworski’s latest project SAVAK dropped a new video from their sophomore album Cut-Ups (out now on Ernest Jenning Record Co.) called “Christo’s Peers (Soon We’ll Be Floating).” The band is headed to Europe next week for a handful of dates. As you may or may not know, Brad Hoshaw is moving away to the West Coast. I’m not sure of the dates or reasons, just that he’s leaving. Which makes tonight’s opening gig at Reverb Lounge for Charlie Parr all that more important. Get yourself some Hoshaw while you can. $10, 8 p.m.